USA Luge and the National Guard have signed a one-year sponsorship that will brand USA Luge sleds, jackets and race suits with National Guard logos. 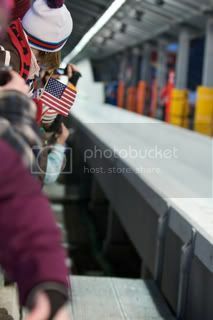 As part of the deal, The National Guard will also assume title sponsorship of the 2011 USA Luge Start Championships. USA Luge has three athletes enrolled in the National Guard’s World Class Athlete Program, which allows athlete / Soldiers to train in the sport as a part of their duties. Those athletes, 2006 Olympian Preston Griffall of Salt Lake City, Utah, as well as brothers Matt (Griffall’s doubles partner) and Joe Mortensen of Huntington Station, N.Y.
As part of the new partnership, both parties will work together to create a National Guard-branded athlete school visit program in the spring. "Having the National Guard’s support is a tremendous honor," said Ron Rossi, 1984 luge Olympian and USA Luge CEO. "We look forward to being marketing partners with one of the most prestigious institutions in our nation as our athletes represent the United States in both the National Guard and the upcoming World Cup season." The USA Luge deal is part of a broader effort by the National Guard, which recently put out a $477 million RFP for an event marketing and public relations agency. The National Guard's new marketing campaign aims "to recruit quality soldiers, conduct attrition management designed to reduce first-term soldier losses and training pipeline losses, and ensure retention and extension of quality soldiers before the expiration of their term-of-service." The winning agency will work with NGB to reach its 17- to 24-year-old audience, focusing on partnerships with organizations such as Nascar, X Games, WWE and IndyCar. Part of the RFP also requests development of internet marketing campaigns similar to the Yahoo "Fantasy Career" event hosted by the Department of Defense.